KIEV, Ukraine -- The United States has delivered more than $260 million in non-lethal military equipment to help the government of Ukraine in its fight against a Russian-backed insurgency, but some of the U.S.-supplied gear meant to protect and transport Ukrainian military forces is little more than junk. An aging U.S. Humvee with worn out tires near Ukrainian front lines. on Nov. 6. Three of the Humvees had plastic doors and windows — barely any protection at all. The tires on one of the trucks blew apart after driving only a few hundred kilometers, the result of sitting in a warehouse too long, said one mechanic. The obsolete equipment was identified on a tour near the front lines in eastern Ukraine with help from mechanics serving in the Ukrainian army and through interviews with front-line troops. In some cases, serial numbers were used to trace the origins of certain vehicles. The decaying state of U.S.-supplied equipment on Ukraine’s front lines has bred distrust and lowered morale among Ukrainian troops, soldiers said. Experts said the low quality of the gear also calls into question the U.S. government’s commitment to a war that is entering its second year, with well-equipped Russian-backed separatists still firmly entrenched in Ukraine’s eastern region. In recent weeks, attacks along Ukraine’s front lines have spiked, with Ukrainian troops reporting casualties almost daily. Last month, five Ukrainian soldiers were killed in one day. “Despite what people think, this is still a war,” a different Ukrainian special forces soldier said. The Humvees observed near the front of the fighting were part of a batch of about 100 sent to Ukraine earlier this year. The vehicles were shipped under a special executive power granted by Congress that allows the president to send equipment to foreign countries quickly. “We wanted to get things there as fast as possible and we had no money appropriated for this crisis,” said the official, who requested anonymity to discuss sensitive policy issues. It is unclear how much of the material sent to Ukraine is secondhand and antiquated. The U.S. government has also sent new equipment, such as night vision and first-aid kits. Troops there have also received advanced equipment such as counter artillery, counter mortar radars, and communications gear. The program sends “the stuff that’s sitting around somewhere that no service can use,” said an official at the Pentagon who spoke on condition of anonymity to speak frankly about the equipment. 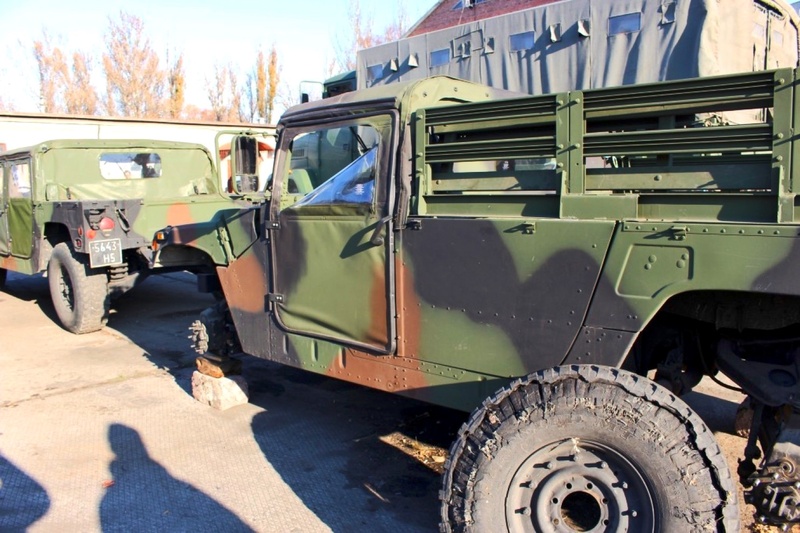 In the case of the Humvees in Ukraine, Lt. Col. Andrei, the operations chief of the unit that received the vehicles, said they were supposed to be sent in working order — not stripped for parts. The cost to purchase a Humvee tire in Ukraine is roughly $1,000, so instead the unit bought a cheap used SUV for a little more than what it would take to replace two Humvee tires. The Pentagon has also devoted resources to the war by having Army units establish various training programs to boost the fledgling Ukrainian military and its abilities to maintain itself. To some however, the battered equipment on the war’s front lines is emblematic of a U.S. policy that has done the minimum to bolster the Ukrainian government and deter a reinvigorated Russia. Rep. Mac Thornberry (R-Tex. ), chairman of the House Armed Services Committee, said there is strong bipartisan support in Congress to help Ukraine. Thornberry pointed to the recently passed National Defense Authorization Act that included $300 million in support — including lethal aid — for the embattled eastern European country. The administration’s “overriding concern here is to avoid aggravating Putin,” said Thornberry in a recent phone interview. When asked about the administration’s goals, a spokesperson for the National Security Council declined to comment on the record. The current aid policy toward Ukraine is representative of the Obama administration’s desire to “do enough militarily to ensure the Ukrainians can defend their territory,” said Evelyn N. Farkas, the former deputy assistant secretary of defense for Russia/Ukraine/Eurasia. But she said that more could be done to deter future attacks. The White House, though, has resisted sending lethal aid with a belief that sending the weapons to Ukrainian troops would only escalate the conflict, said Farkas. “This is about our values. This is about the right of Ukraine’s citizens to elect their government and to be fully sovereign and not under Russia’s thumb,” she said.